Neje believes that happiness starts with a healthy home and, as a certified horticulturist who lives with an environmentally-induced illness, we should be listening. A lifelong—and devoted—Harlemite, Neje got involved with WE ACT last year. At 44 years old, Neje finds vibrancy in the history of her community, knowing that “wherever I go I am retracing my footsteps as a child and passing by family memories.” But despite a lifetime trekking concrete streets and catching underground trains, Neje maintains a firm connection to the soil: she and her fiancé are urban farmers. 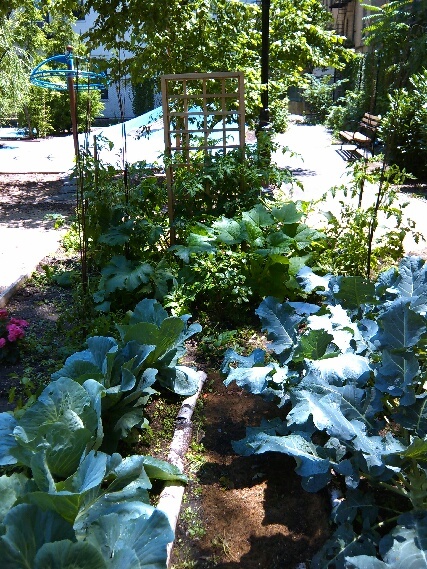 Their plot in the community garden where they live is currently at the height of summer season, bursting with every vegetable you can think of from varieties of tomatoes to acorn squash to chocolate basil and edible flowers. They share their harvest with neighbors and also subscribe to a CSA (Community Supported Agriculture), a program whereby you pay a local farmer at the onset of growing season for weekly delivery of their produce. Speaking of family history, Neje is a direct descendant of Fredrick Douglass, the famous abolitionist who escaped slavery to become one of the most influential authors, orators, and social activists of the 19th century. In addition to an illustrious legacy, Neje’s family has a long history of environmentally-induced illness. Her West Harlem apartment, which she inherited from her grandmother, is in Esplanade Gardens, across from the Mother Clara Hale Bus Depot that many WE ACT members know well. WE ACT organized to transform this depot from a toxic pollutant to a cutting-edge, local art and eco-roof-clad facility designed to reduce environmental impact on the neighborhood. But before this 2015 victory, Neje grew up amidst rampant soot and exhaust from the Depot as well as the adjacent FDR highway. Neje remembers sickness all around her: her neighborhood had the most cases of asthma in the country, her extended family suffered from cancer, and Neje’s own mother passed from cancer. Balance is the key to a healthy, happy life—and also challenging to maintain. Before MS, Neje was a highly successful photo stylist working for magazines Martha Stewart Living, O, In Style, and Real Simple. But after her diagnosis, Neje knew the grueling long-hour, high-stakes photo shoots were too high-stress for her health. She retired from photo styling, tidied her life of everything unessential or stressful, and prioritized self-care. But she remained determined to carry on her family legacy of social change. 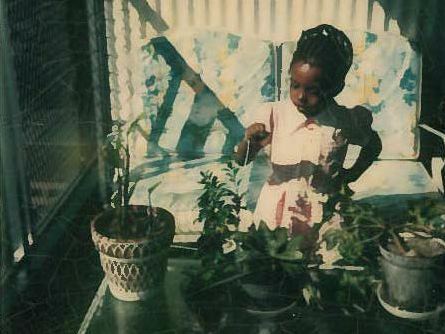 Before MS and meeting her fiancé who is devoted to food justice and urban farming, Neje had always grounded her city surroundings with nature. Since the age of four, she was intrinsically drawn to plants, dozens of which her mother kept in every corner of their home. In college, Neje finally learned why she was so attracted to flora. Despite her mom being a lifelong smoker, it wasn’t until smelling cigarette smoke in her dormitory that she learned how intense and off-putting it can be—her mother’s plants had done such a good job filtering the air of their apartment. Neje decided to learn professionally about her childhood proclivity and earned Floral Design certification from the New York Botanical Gardens, worked in the floral department at Whole Foods, and joined the staff of Nubian Heritage, a Harlem start-up that produces wellness products based on traditional healing practices with indigenous ingredients. Together with her fiancé, she learned about the hormones and pesticides with which corporate agriculture laces into our food supply, the homogenization of plant varietals, and farm worker abuse. Having witnessed WE ACT’s work to redesign the Mother Clara Hale Bus Depot, Neje knew that, like she, WE ACT was committed to Harlem and to making life better for its residents—starting with a safe and healthy environment. In summer 2015, Neje enrolled in WE ACT’s biannual Environmental Health and Justice Leadership Training (EHJLT). As part of a class of 20, she learned over the eight-week training the foundations of organizing, the elements of advocacy, and about issues including clean air and affordable and equitable transit. Two sessions were dedicated solely to food justice and healthy homes, where Neje studied the structural racism that results in unhealthy school lunches for Northern Manhattan children of color and WE ACT’s work to prevent environmentally-induced disease with the Columbia’s Center for Environmental Health in Northern Manhattan’s Community Outreach Education Core. The “Trash to Treasures” tour especially resonated with Neje, where she learned things she had never known about economic and policy forces shaping the face of her lifelong neighborhood. This summer, Neje traveled with WE ACT to Albany to rally and meet one-on-one with legislators in support of The New York State Climate and Community Protection Act, climate justice legislation that creates union jobs, renewable energy, and directs funds to neighborhoods disproportionately harmed by climate change by issuing a fee to polluters. Neje now plans to apply the skills she learned at EHJLT to her project Plant Power. It is a straightforward, impactful idea: use the power of nature to make your home healthy. “You may not be able to afford green paint and organic-upholstered furniture,” she says, “but you can clean your apartment air with a few houseplants. If I pass you on the street and you’re smoking, I’m going to give you a plant.” Neje is currently working to develop grant proposals for Plant Power. If you’re interested in learning more about Plant Power or joining Neje in her work, you can contact her via email: nejebailey@yahoo.com. Author: Courtney Sproule, a new WE ACT member, is a communications professional and creative entrepreneur. As a chef who loves excellent ingredients but can’t keep an air plant alive, she is very grateful for talented farmers like Neje.